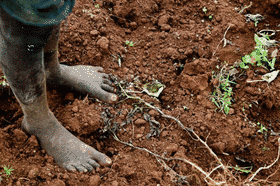 5 December 2018 (FAO)* — These days pollution is a worry – and soil is also affected. Soil pollution is a hidden danger that lurks beneath our feet. With a growing population expected to reach 9 billion by 2050, soil pollution is a worldwide problem which degrades our soils, poisons the food we eat, the water we drink and the air we breathe. The entity of the problem is still unknown as not certain data are available on a global scale. Soils have a great potential to filter and buffer contaminants, degrading and attenuating the negative effects of pollutants, but this capacity is finite. Most of the pollutants originate from human activities, such as unsustainable farming practices, industrial activities and mining, untreated urban waste and other non-environmental friendly practices. It is time to uncover this threatening reality. Combatting soil pollution requires us to join forces, and turn determination into action. Be the solution to soil pollution.